March 29, 2018 By Personal thoughts and beliefs of E.B.Shrager - do not represent those of any past or current employer. Misguided parents will be unhappy with the unintended consequences of their fears dictating constant communication with their children. At a recent national conference, teachers shared their stories with me about a shift in the past two years: parents feel entitled to exchanging texts with their children all day while they are in school. Previously parents would text info for after-school logistics that would be read at the end of the school day. Now they micro-manage their children’s experiences – preventing their children from connecting with other adults in the school community. The African proverb about needing a village to raise a well-adjusted child has been replaced with isolation and the sole lifeline to mom and dad. 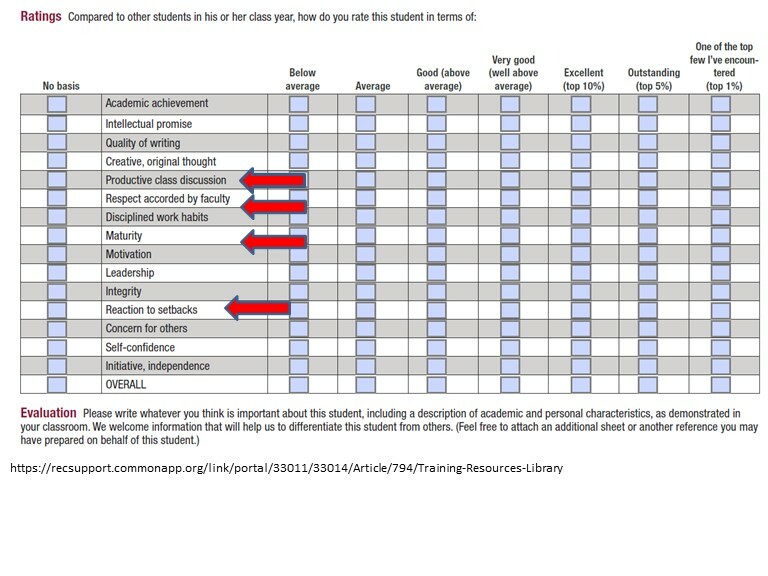 This creates anxiety for the students and satisfies some need of the parents. But the good feeling that parents experience by satisfying that need is fleeting because their child doesn’t learn to self-soothe, doesn’t learn to trust and work with other caring adults, and doesn’t learn to independently negotiate sticky situations. Some parents are smug that their children can live in their house for as long as they want. They are the lucky ones, because what these misguided parents don’t see coming on their horizon is that when their child becomes sexual, their sexual partner will replace the parents. Their child’s sexual partner will be the one who is called for every decision and the partner is not going to share with the parents. Their child is used to one lifeline, and it can’t continue to be the parents because of sexuality. These parents will be appalled at how their child is attracted to someone who isolates him or her from others. They will struggle to see that it is a natural consequence for their actions. These parents can’t believe that they were so close to this child and now they only see the child on certain holidays on certain years. One such pair of parents were horrified when the new spouse explained the Christmas visitation schedule: one year with her parents, one year with his parents and the third year just the couple and no parents. The rise in parents unable to leave their children alone for seven and a half hours a day while they are in school coincides with another shift that recent research attributes to social media and cell phone usage: a rise in student anxiety. Many schools now have ‘quiet rooms’ for anxious students. While in the past teachers sought out anxious parents to help soothe the transition for them and their students and eliminate the anxiety, not all parents think the anxiety they have and the consequences it has on their children is a bad thing. Some parents judge the quality of their parenting by their level of anxiety. When one parent was asked if she felt better about her child going to a new school after a tour of the new building, the mother replied, “Oh, no, you have to understand, I have been the most anxious parent since kindergarten and nothing will change that!” She was proud of her anxiety as if that would win her “The Best Parent Ever “award. Good parenting is more of a marathon than a sprint. If your goal is to raise wonderful, independent adults, help yourself and your children by not texting them all day while they are in school. Let them develop other adult resources to help them navigate through their day. Start in middle school/junior high and show restraint. Help them to negotiate social situations in advance with “what if” scenarios. Strategize with them how to approach teachers about makeups and missing grades. Equip them and then let them try it and wait until the school day is over to get your report. If they are upset and have to get through a couple of hours of being upset, it doesn’t make you a bad parent – it makes you a good parent who is developing some age-appropriate inner strength. It just might help you to stay in better contact with them when they are adults by choosing partners who share and not isolate. 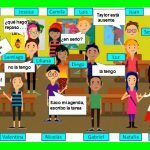 If your child takes Spanish, consider donating these videos to their Spanish teacher to play at the beginning and end of class. 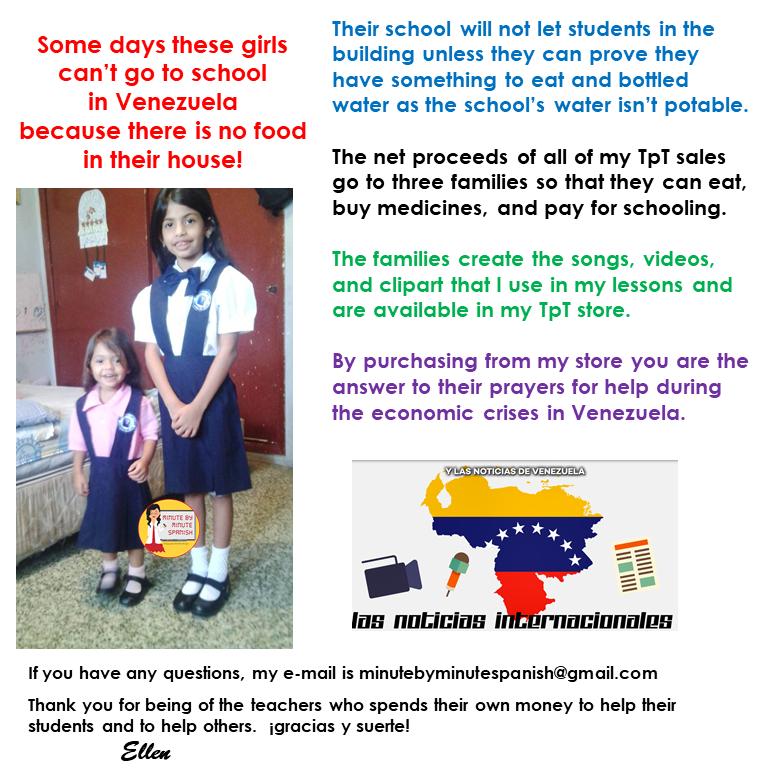 All net proceeds go to three desperate Venezuelan families who create them. 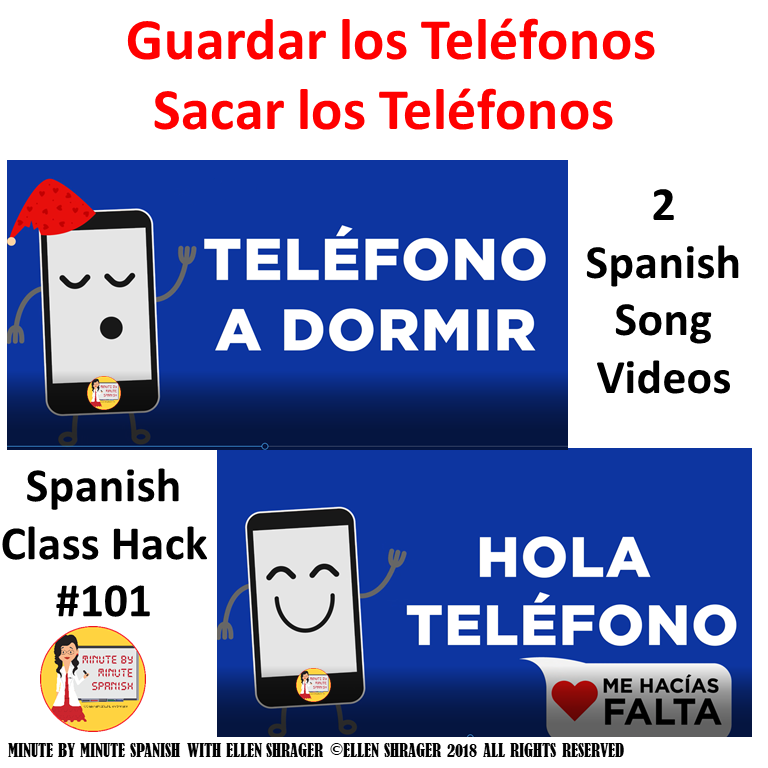 Stay on task and in the target language by having students put away their phones. Purchase here to help support some desperate Venezuelans. 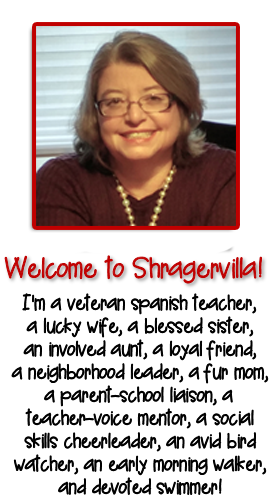 February 25, 2018 By Personal thoughts and beliefs of E.B.Shrager - do not represent those of any past or current employer. Spanish ordinal numbers from ellen shrager on Vimeo. 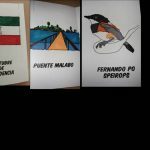 A Spanish teacher, Patty, asked for ideas for teaching ordinal numbers. 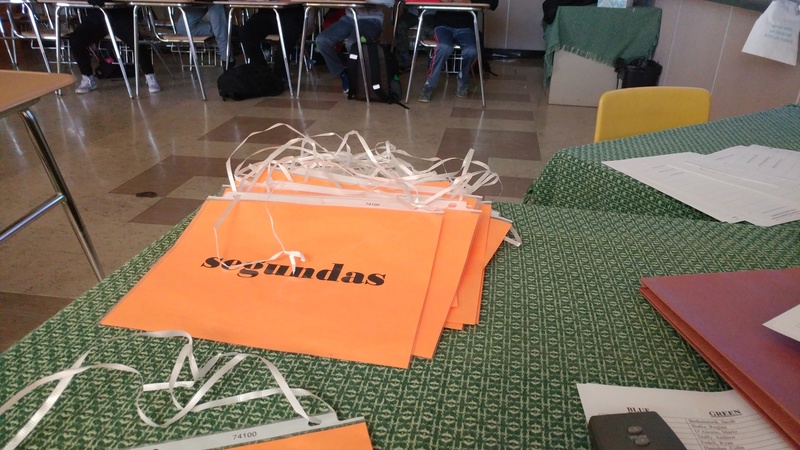 I make a class set of ordinal numbers inside page protectors and attached with ribbon – I want them to last until I retire! Each student hangs it on his or her desk. 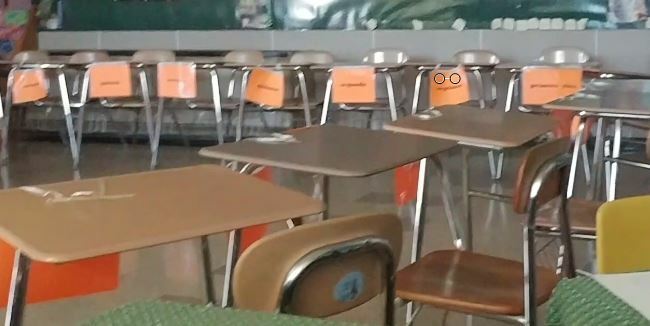 The desks are in a circle so that we can see one another’s number. We do a chant – slap the desk twice and as you snap the first time you say your number and as you snap the second time you say the number of someone else. Once the person you have called upon passes successfully to the next person, then you can lift up your sheet and not be called on. But if there the person you call on goes off beat, then I, as the teacher, restart the chant calling on you.